Make the best of your dining area and beyond with the Bullet Stool Cream. Perfect whether paired with a dining table, coffee table, dressing table, desk or something else entirely, the Bullet is a brilliant multipurpose piece to add to your interior. 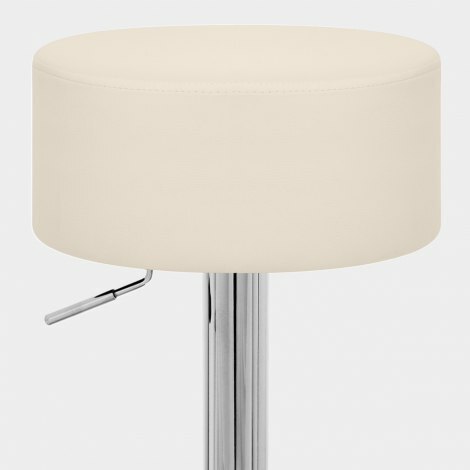 The stool mixes a faux leather seat with a chrome frame and a selection of features. Backless for total convenience, the clever Bullet can be slid under work tops where necessary then pulled out so as to flourish in its own ambrosial right. Further to this, the stool is height adjustable and able to rotate 360 degrees, boasting a utility that belies its petite size. Finally, a protective rubber ring helps you to use the Bullet to your heart's content without having to worry about friction with flooring. "Very comfortable and ideal height range"
Amazing service. Dispatched within a couple of hours of ordering and received less than 24 hours later. So easy to assemble, sturdy, comfortable and is excellent quality. Would highly recommend. Order arrived promptly, easy to assemble and exactly what we were looking for. Sturdy, quality product, well made and good value. A great stool. Ideal height and hides neatly under the dining table. Stool looks good, easy to assemble, excellent price, comfy to sit on. It matches my dressing table perfectly. The product is excellent as was the service.